If you can’t say no to someone’s request for assistance then you’re likely to be a ‘People Pleaser’. People Pleasers have an inner belief that declining someone’s request for help will result in consequences that are too much to bear, particularly if the request comes from someone more senior in authority. These self-fabricated consequences are rarely grounded in fact yet the ironic thing is that taking on these extra demands puts them in a position of risking burnout and if this happens, relationships become strained, their careers stall and the feelings of helplessness and despair are far worse than a momentary feeling of guilt. Here are some tips on how you can say no. Be more proactive. Discuss commitments and deadlines with your manager so when they ask you to drop everything, you can remind them why it is not possible. State your position. It’s not about just saying ‘No’. By offering a statement that states your position it softens your response. ‘I’m afraid I can’t right now, I have a major deadline to meet by 4pm tomorrow’. Have words up your sleeve that you can use when you initially respond. Be firm, but empathetic, ‘I’m afraid that’s not possible’, ‘I’m afraid there’s no chance right now’, ‘I’d rather not because…’, ‘I’m not the right person to ask right now…’. Take control of the situation. Stand up, if they’re standing. Listen, think, respond. Do not feel obliged to ask any questions, it may weaken your response. If you have an inkling that they’re going to ask you to do something, pre-empt them and say, ‘I have a suspicion that you’re going to ask me to do something for you, I’m sorry but it’s absolutely out of the question right now’. Keep a record. 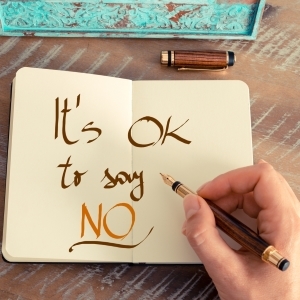 If it’s hard to say ‘No’ and you frequently have to capitulate, then keep a record of the extras being asked and the impact this has on your workload and your capacity to cope. Have a conversation with that person about the impact they are having on your workload and set some expectations on how to better manage this going forward. Learn more about saying no in my best-selling book, ‘How to Prevent Burnout’.